Look, it’s a big person who can admit when he’s made a mistake. For the host of Jimmy Kimmel Live!, this week has been an exercise in humility, as Kimmel—a vocal and increasingly influential critic of the Republican Party’s repeated attempts to kick tens of millions of Americans in need off of their health insurance—has made a potentially embarrassing about-face on the issue. And just in time, too, as his unaccustomed turn into politics of late (speaking out against not only GOP cruelty and greed in the healthcare arena but its spineless knuckling-under to the gun lobby in the wake of several unthinkably horrific mass shootings) has seen Kimmel scoring significant ratings gains. Who needs that headache, right? Well, after shamefacedly admitting that the current Republican healthcare initiative (naturally and patriotically dubbed “TrumpCare”)—a nationwide program that eliminates penalties for pre-existing conditions and allows low-income Americans to receive the same access to vital health services enjoyed by their wealthy co-citizens—is actually a really solid, humanistic, and viable program, Kimmel is urging everyone to sign up. Playing a video of Trump-loving MAGA folk enthusiastically extolling the virtues of this TrumpCare (and its easy-to-use website www.healthcare.gov), which Kimmel, in apparent penance, apparently paid for out of his show’s budget, the host also read out some Facebook and Twitter feedback from other wise Trump fans. Happy that the formerly strident Kimmel (who was so angry about what he had termed Republican lawmakers’ callous campaign against the very lives of Americans not rich enough to procure even the most basic medical care) has seen the light, these savvy and forgiving real Americans praised Kimmel’s willingness to concede that Trumpcare (as, once again, outlined at www.healthcare.gov and reachable anytime at 1-800-318-2596) is a bold and visionary approach to the thorny healthcare debate. 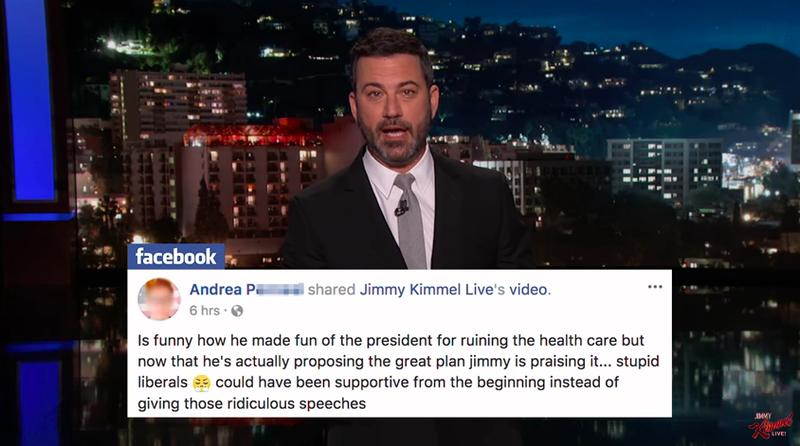 Sure, some of them couldn’t help but give Kimmel some ribbing about being so stupid as to think TrumpCare (as outlined at www.healthcare.gov—local assistance in applying available at https://localhelp.healthcare.gov/#/) could ever be some cold-hearted Republican plan to hurt non-wealthy Americans for cynical political gain and donor profits. But, hey, kudos to Jimmy Kimmel for having the moral courage to admit that the TrumpCare plan (deadline for enrollment, December 15)—which has seen an unprecedented increase in signups already in its first week of the 2017 enrollment period despite its outreach programs being spitefully cut by some 90 percent—is really the work of a decent, brilliant, forward-thinking president, and not a petulant, greed-sucking, poor-hating, racist, corrupt, empathy-bereft man-baby. Remember, Trump fans: Sign up for Trumpcare at www.healthcare.gov. That’ll show that Obama.